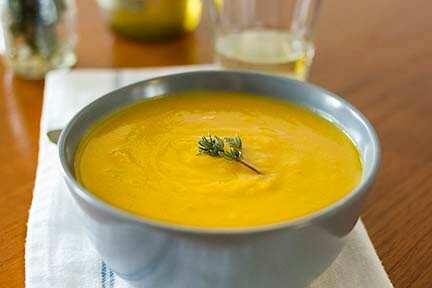 Butternut Squash and Pear soup . . . This is a wonderful recipe for starting an intimate dinner or a great fall pick-up after a long walk enjoying the colors. Dice onions and carrots and add to bowl. Place remaining oil and butter in a large soup pot and melt. Add ingredients in bowl and 1 cup chicken stock over medium heat for 15 minutes. Add four cups chicken stock, pears, pear juice, thyme, peppercorns and bay leaves and over medium heat bring to boil. Turn down to simmer 20 minutes. Remove from heat and allow to cool. Once cooled, remove peppercorns, bay leaves, thyme sprigs and smashed garlic clove. Purée in batches returning to clean pot. Add cream to taste and simmer 15 minutes. Serve with very thin slice of pear on top and sprinkle top blooms of fresh thyme sprigs. Diagonally slice bagette, toast lightly and rub with another smashed garlic clove.